In this week's episode of the Hockey Night in Canada podcast, we take a look at the keepers of the crease and what makes them so different from their teammates. Rob Pizzo is joined by Stanley Cup champion Ilya Bryzgalov, as well as John Garrett, who has some interesting stories to share on his playing days in the WHA and the NHL. This week, it's all about the keepers of the crease — the goalies. The members of the goaltenders union tend to be a strange bunch. Who voluntarily wants to stand in the way of a 160 km/h puck? They also tend to be superstitious. Patrick Roy talked to his goal posts. Glenn Hall played a record 502 consecutive games and threw up before every one. Ron Hextall used to bang both ends of his stick against the posts at the beginning and end of every period. In this episode, we will try and figure out what makes goalies so different. 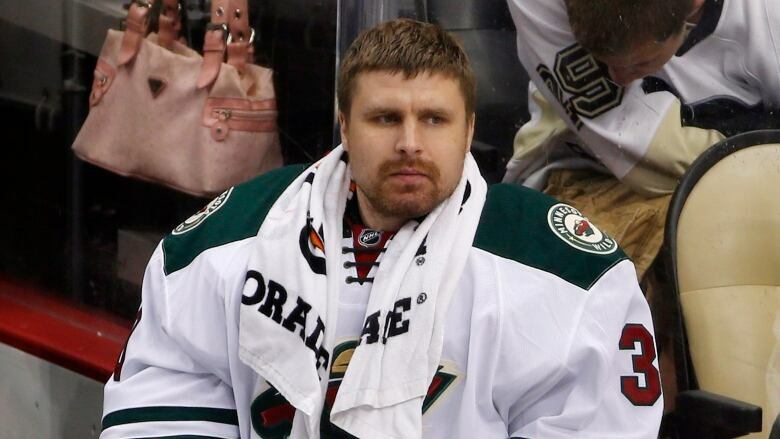 One of the most unique and colourful goalies of our era Ilya Bryzgalov joins Pizzo. The Stanley Cup champion talks about his early days playing the game in Russia, where he used speed skating skates to play net, and how he avoided a certain pre-game meal at all costs. John Garrett, who played 530 NHL and WHA games, also joins Pizzo and has an interesting story about playing an entire period with a hot dog in his pads. You will have to listen to it to believe it. Brodeur vs. Roy: Which Hall of Famer is greatest goalie ever?